About » James Betelle, Where Are You? In 2005 I wrote this little essay at my personal website. Since writing it, nagging thoughts persisted; what had happened to my school since I was last there, nearly 30 years ago? Is it as I remembered? Is my graffiti still on the bathroom wall? My foray into answering these questions led me down a tangential route; the intriguing and mysterious story of the architect of this, and many other schools in my hometown of Maplewood, New Jersey. 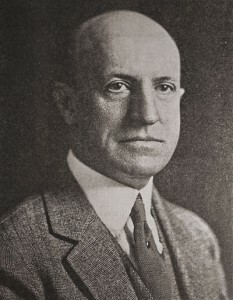 James Oscar Betelle headed the firm Guilbert & Betelle, which created many significant public schools and civic structures in the Northeast of the United States, primarily New Jersey, New York and Delaware. He favored the Collegiate Gothic style of architecture that was pervasive in the early part of the 20th century, but also designed Federal, Georgian and Art Deco edifices. The mystery lies in the fact that his firm disappeared quite suddenly, sometime in the late 1930s or early 40s. There are no known records of any firm absorbing it, or what became of his material or personal effects. He had no children, and died in Florence, Italy in 1954. It is my hope that this website will serve as a personal account of my search, but also to make this man’s contributions to civic architecture better known (and hopefully to get some clues from readers with information). To the best of my knowledge, the material presented here (both written and visual) has long since passed into the public domain, unless otherwise noted. Any copyright infringement is purely accidental, so be kind if you call me on it. Updates available via RSS and Twitter.